This elegant ring in pure silver designed with a 13-Mukhi Rudraksha is a perfect talisman with bhasma and metal of planet Venus enclosed in tubes, and beeja mantra of planet Venus inscribed on its sides. 13 mukhi provides a hypnotic power of attraction or Vashikaran. It bestows charisma, divine charm and a magnetic personality to the wearer. This Rudraksha is ruled by planet Venus also called Shukra Graha. It is beneficial for those suffering from the malefic of Venus or Shukra Dosha, and those planning to have a baby. It is ruled by Lord Kamdeva. Rudraksha beads may be worn as necklaces, bracelets, rings or lockets. This 13-Mukhi Venus planetary ring is convenient to wear and bestows you the grace of Lord Kamadeva. 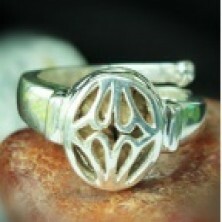 Made in pure silver in an elegant design suitable for female.